RUSSIAN DOLL. Created by Natasha Lyonne, Amy Poehler and Leslye Headland. Featuring Natasha Lyonne. Netflix. I don’t know if it was because I was still jet lagged from my trip back from New York, and I was seeing the city and its people again in this surreal yet familiar way, but I soaked up each episode of Russian Doll and have not been able to stop thinking about it since. Groundhog Day happens to self-absorbed and unlikeable Nadia Vulvokov (Natasha Lyonne – of Orange is the New Black fame) at her 36th birthday party. She is forced to undergo a series of deaths before returning to the exact same moment in her friend’s bathroom and she has to find out why. Along the way she meets up with Alan (Charlie Barnett), who is also dying and rebirthing in front of his own bathroom mirror. With strange tell-tale signs that things are not as they seem – rotting fruit and disappearing people and furniture – the two have to work out what they have done, and what they need to do to stop this endless cycle of deaths. It’s a classic case of the characters having to learn the hard stuff about themselves, recognise the failings in each other, guide each other to a better understanding, then change themselves and each other. This sounds very preachy, but the show really isn’t. 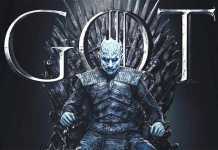 The characters are dark and largely unpleasant, with bleak pasts and destructive behaviour. And yet, we start to care about them and want them to work it out. 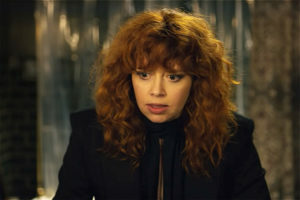 Natasha Lyonne gives a huge, outrageous and brilliant performance in her betrayal of the brash, self-destructive freight train, Nadia, that barrels though those she comes into contact with. The grand Elizabeth Ashley plays Ruth, Nadia’s aunt with depth and pathos, and Charlie Barnett’s Alan is heart breaking. But the smaller roles are as good, and really brilliantly cast. It takes a lot to sustain the fiercely improbable, and the premise handled with less boldness could have fallen flat, but it doesn’t, and I was hooked in right until the end. Russian Doll is typical New York, with a twist, and it is dark, mesmerising, bitterly funny and ultimately redemptive. I know that hardly makes sense, so I recommend checking it out for yourself. I have a feeling that this is going to develop a true cult following. And, Oatmeal the cat is particularly good.